Many members of Team SKA work within industry, collaborating with research institutions and government bodies around the world to design the SKA’s core elements. 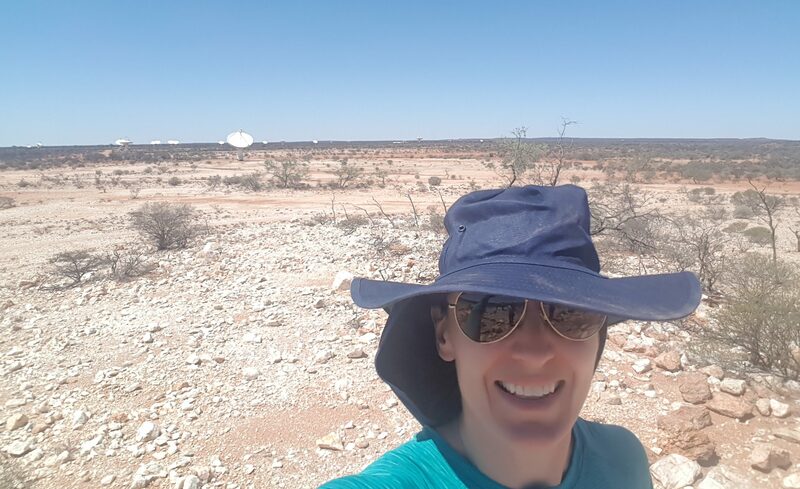 Rebecca Wheadon, of engineering consultants Aurecon, is Project Manager for Infrastructure Australia, working alongside consortium leaders CSIRO to develop the SKA-low telescope site. 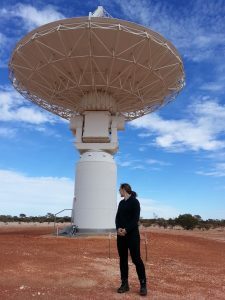 We spoke to her after the consortium’s Critical Design Review to discover more about her role, and how an early encounter with an Amstrad computer set her on a path towards the SKA. Tell me about your background – did you always want to work in engineering? My background is quite varied but has predominately been in ICT and Telecommunications. Ever since I was little I have always loved tech, although the term ‘tech’ in my day was nothing like it is now! When I was eight or nine, I was the girl playing Donkey Kong or Elite (a game about being a trader in space, no less!). In fact, one way I would spend time with my mum was to sit and code my own games on my Amstrad; I was never particularly good at it, but this gave me an appreciation for how both computers and coding work. What was your route to Aurecon and the SKA project? The most significant step I made towards my current path was working for an Internet Service Provider back in the early 2000s, a job I absolutely loved. I started off doing helpdesk and progressed to managing a team of helpdesk consultants; this is back in the day when 33.6kb modems were still a thing. One of my least useful talents in life is being able to recite a generic AT modem initialisation string. From there I progressed to assisting with the project management of a large network integration, which taught me an awful lot about dealing with people from all walks of life. Nobody ever rang the helpdesk to say what a great day they were having; it was always problems that had to be solved on the spot by you. It also taught me the fundamentals of leadership. I worked for telecommunications carriers, doing commercial acquisition and negotiation for their network infrastructure, before Aurecon asked me to manage their telecommunications infrastructure design team. What made you want to get involved in the SKA? It was really my personal interest in the SKA that saw me follow the project. We have had a strong relationship with CSIRO since the 1960s, having assisted on a number of astronomy projects. So when the opportunity arose to help them coordinate Australia’s bid to be the host country, I was first in line with my hand up, and here I am 10 years later! Let’s talk about your role as Infrastructure Australia (INAU) Project Manager – what does that involve? My role is easiest described as coordinator and trouble shooter. On the Aurecon engineering side I lead the team, negotiate contracts, define project management protocol, oversee finance, quality, schedules, resourcing, escalation issues, milestone inputs and safety, interpret project requirements… whatever is needed to keep things rolling and meet milestone targets. If it’s related to time and money, I have probably got something to do with it. Within the consortium, my personal goal is to make the job of Ant Schinckel, the INAU leader based at CSIRO, as smooth as possible, so he can stay focused on running and representing the consortium. What’s been the most exciting or surprising part of working on the SKA so far? The most exciting thing for me has been watching a concept become a reality over the course of my involvement. I’ve really enjoyed watching the many hundreds of individuals all over the world work together towards a common goal. This project really is remarkable in so many ways and I love being a part of it. We spoke on International Women in Engineering Day, which aims to boost the number of women in the sector. What do you think needs to happen to enable that? As the concept of gender neutral education becomes the norm, I personally believe that a generational shift is already under way which will address the industry gender balance in years to come. I never dreamed of studying engineering as a young girl even though I had an affinity for tech – when I was at school the girls learned sewing and cooking, while the boys learned woodwork and mechanics. That simply doesn’t happen anymore. There is no quick fix – it takes time, patience and education. As employers and business leaders we have a responsibility to be involved with the education of school age kids and introduce industry skill requirements earlier than ever. We already know that many of the traditional jobs today will not exist in 20 years’ time, and it’s the next generation that will continue to change and grow the industry. We need to spark the imagination of youngsters and show them all the cool stuff they could be a part of just by being their capable selves. With that in mind, what are the most important skills one needs to work in engineering? To be honest, I think we need just about everything nowadays! Engineering has modernised so quickly in recent history, and the rate of change is accelerating every day. I am quite sure someone could draw me a graph of that. Engineering doesn’t mean being really good at maths either – in my experience a common industry trait is curiosity, as we all look for the ‘why’ in all that we do! Your work has taken you around the world, do you have a highlight? One of my favourites was Edinburgh. We had an SKA conference in the Old Town and I had an opportunity to explore the lanes around Edinburgh Castle. What a spectacular part of the world! A number of times I stopped quietly for a moment to watch the people go about their business, so many seemingly oblivious to the 500-year-old architectural masterpiece holding the modern facade of a chemist or shoe shop. The two are at complete odds with each other, but it all just works. Working on a project of this scale and complexity must be stressful at times – do you have any hobbies that help you unwind outside the office? 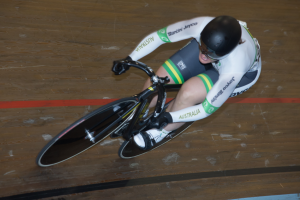 I am a track sprint cyclist in my spare time, and have represented my state and my country. I really enjoy the discipline of the training and competition, and I also now coach a number of athletes. Sport has also helped me forge new friendships in other countries and also grounds me to the community. Any medals in the cabinet at home? I do indeed have some medals at home, but I don’t compete to win medals, I do it because I love the discipline and psychology behind it. I am the current world champion and world record holder (in my age group that is!) in one of the velodrome sprint disciplines. I am very proud of that achievement as there is an awful lot of work and a whole raft of people aside from me that make something like that possible. Even though I ultimately ride the bike, I think most credit belongs to my coach. Cycling started as a hobby for me and I fell in love with it. As with anything I start, I have a tendency to want to do a good job of it, and I guess world champion is about as good a job as I can do!